This simple vegan pesto recipe without cheese tastes surprisingly like the real thing! The secret? Nutritional yeast to replace the Parmesan cheese - and lots of extra garlic. Well, that and the fact that the primary flavor in pesto is actually basil, which means that you don't really need or miss the Parmesan cheese. But do be sure to use a nice quality fresh basil for the freshest-tasting and most flavorful results. Toss this simple vegan pesto with pasta, use it as a pizza sauce to make a vegan pesto pizza or serve it up with bread or crackers for an appetizer. 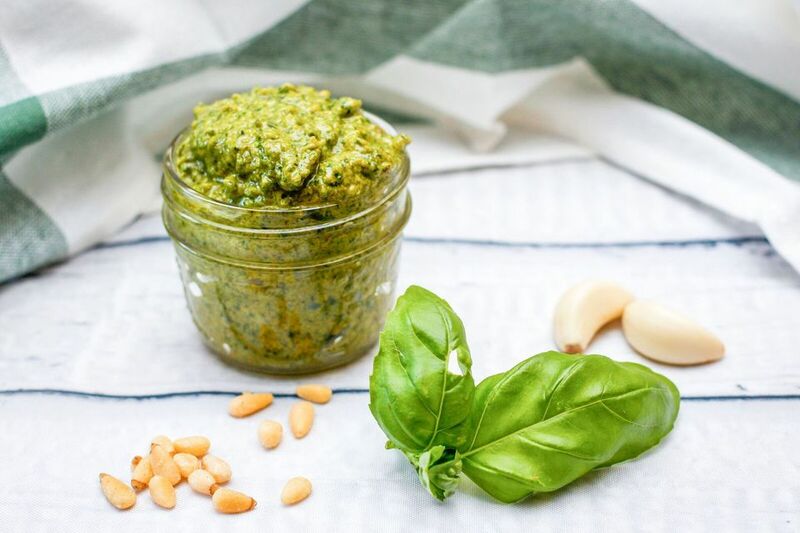 Vegan pesto is very quick and easy to make as long as you have a good food processor, although a true purist would prefer to prepare it using a mortar and pestle, and you can also use a blender just as well. This quick and easy pesto recipe is vegetarian, vegan, and gluten-free, and is also a raw foods recipe suitable for anyone on a raw vegan diet. Combine all ingredients in a food processor until nuts are ground. Pesto should still have texture and not be completely smooth. Add to pizza, pasta or other dish and enjoy! One variation is to add 1/2 cup rehydrated sun-dried tomatoes. For a lower fat version replace half the oil with soy milk. Without the cheese, you need all the flavor you can get for a good vegan pesto recipe. For the best flavor, skip the flax oil or grapeseed oil or whatever you sometimes experiment with and stick with a high-quality olive oil. Other high-flavor oils you might experiment with are walnut or avocado but note that these will change the flavor of your vegan pesto.